The G.A.S.T heat allocation meter is the standard G.A.S. meter designed for use in the timing of heating or domestic hot water systems.This meter has multiple applications including FHA, central or individual domestic hot water heater, fan coil or fireplace. The G.A.S.T meter uses the proven G.A.S. hardware design to provide more accurate timing measurements in 36 second increments using standard non-proprietary equipment. The G.A.S.TTA heat allocation meter is a version of the standard G.A.S.TT meter designed for use in baseboard hydronic heating systems that employ a 24vac zone valve. The G.A.S.TTA meter uses the proven G.A.S.TT hardware design and employs a single pipe-mounted thermistor temperature sensor in conjunction with an air sensor rather than connection to the 24vac zone valve. This design increases accuracy and simplifies installation. The G.A.S.TTA is installed in an apartment at the midpoint of the baseboard heating loop to measure the average radiation pipe temperature over time to determine the total BTUH heat delivered to the apartment. Room air temperature is also measured continuously to correct for different ambient air temperature between 40°F and 90°F. The meter is typically located in the living room area of the apartment and is normally installed at baseboard level adjacent to the hydronic element. The use of air and pipe sensors along with the firmware algorithm effectively meter the hydronic loop for total BTUH heat output. The G.A.S.TTA includes tamper detection circuitry which detects resident tampering, battery failure or meter failure to facilitate meter servicing. 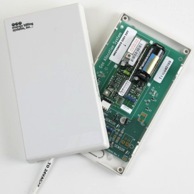 Time -Temperature data output is directly compatible with the standard G.A.S.TT allocation meter.